Amber Francesca's cosy pom-pom slippers will make a great gift this Christmas! "I don’t know about you, but now the evenings are drawing in and it’s getting a bit chilly, I feel the cold. It’s this time of year that I think about making warm woolly things; jumpers, throws, shawls and socks." Fancy making Simone Francis's latest project (left)? 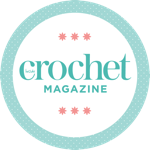 For a limited time Artesano are offering Inside Crochet readers 10% off any of their 4-ply yarns, including the alpaca silk used in issue 71's Swing Top!